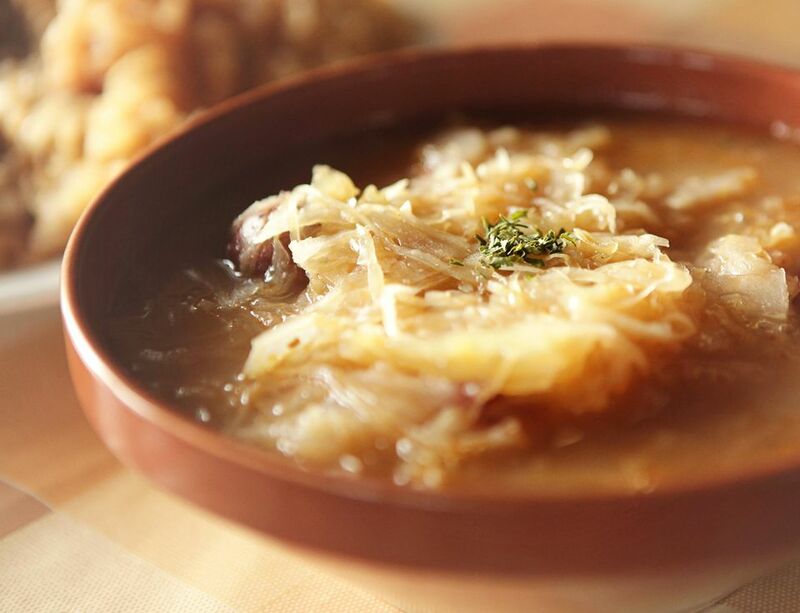 This is a recipe for Lithuanian sauerkraut soup, or raugintu kopūstai sriuba, which is often eaten as a hangover remedy after a night of drinking and partying. Many recipes exist, but this one includes smoked pork ribs, fresh cabbage, and sauerkraut. Some people add carrots and a grain like barley or millet. Serve with hot boiled potatoes and rye bread. In a large saucepan or Dutch oven, place smoked meat, water, onion, bay leaf, and peppercorns. Bring to a boil, skimming off any foam that rises to the surface, reduce heat and let simmer partially covered 1 hour. Remove meat, bay leaves, and peppercorns. Add sauerkraut, bring back to the boil, reduce heat, and simmer 30 minutes. Add cabbage, bring back to the boil, reduce heat and simmer 15 minutes or until cabbage is tender. Adjust seasonings. Remove fat and bones from meat, chop and return to the soup, if desired, or serve on the side with hot boiled potatoes and rye bread. If desired, allow soup to cool completely, skim off any fat that rises to the surface, reheat, and serve.